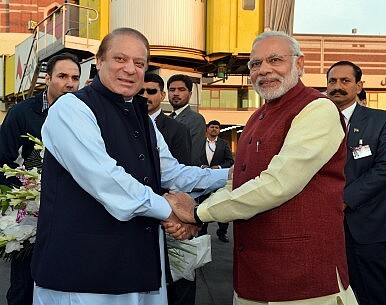 Modi’s Pakistan Trip: A Political Stunt or Considered Diplomacy? What was behind Narendra Modi’s foreign policy stunt in Lahore? Political showmanship has assumed a new meaning in the Indian subcontinent. Photos of the Indian prime minister, Narendra Modi, hugging and walking hand-in-hand with his Pakistani counterpart, Nawaz Sharif, send a powerful message that words cannot convey. These pictures might have some profound implications, potentially signaling the warming of a relationship that has been frozen since the center-right Bharatiya Janata Party (BJP) government assumed power in Delhi in May 2014. The unannounced visit by the Indian premier to Pakistan, the first in over a decade, and the surprising display of camaraderie in full view of cameras, might promise a new era of engagement between the two South Asian neighbors. However, while the images seem promising for the bilateral, they have not reassured everyone. Observers in India and Pakistan wonder whether this is just another one of Modi’s publicity stunts. The Indian premier has become famous for his political showmanship. Modi landed in Lahore unannounced on December 25, after a state visit to Kabul, Afghanistan. Never before had an Indian leader visited Pakistan in such a dramatic and unexpected way. It was widely known that Modi would make a stopover in Afghanistan on his way back to India after a visit to Russia. However, his visit to Lahore was completely unexpected. During his brief stay in Lahore, the Indian leader not only congratulated Sharif on his birthday, but also blessed the wedding of the Pakistani prime minister’s granddaughter. Although the official version of events in Lahore says that this trip was planned on short notice, some reports in the Indian media are claiming that it was planned well in advance. The world is still clueless as to how and why New Delhi decided to abandon its 13-year-old policy in favor of a complete overhaul of the relationship with its traditional rival. There is deep skepticism about the chances of success for the current round of engagement with Islamabad. In India, observers and analysts are wondering if the personal relationship between the two leaders can be a substitute for institutional engagement between the two countries. Such skepticism is well-founded. The way diplomacy has been conducted between the two neighbors does not encourage high expectations. Over the last 18 months, talks between India and Pakistan have been cancelled twice. Although the new “informal diplomacy” by Modi has lead to praise from many in Indian society, it eludes political consensus at home. The main parliamentary opposition, the Congress Party, says that the BJP leader is making a “joke” of diplomacy and lacks “seriousness and gravitas.” When the Congress Party was in power, the BJP always opposed the normalization of relations with Pakistan. One strain of thought in India suggests that Modi, who has been losing popularity with the Indian electorate after a lackluster performance in office over the last 20 months, wants to resurrect his aura and popularity by undertaking bold diplomatic overtures towards Pakistan. Furthermore, the BJP is facing crucial regional elections in states like Assam, West Bengal, and Uttar Pradesh in the coming 18 months. These are states with substantial Muslim populations. One possible motive behind Modi’s Lahore stunt could be to try to win these crucial Muslim minority constituents. Whatever the reasons for the overture, it is a good sign that a new beginning has been made to redefine the relationship between these two neighbors. India and Pakistan are the fulcrum of South Asia and they preside over the destinies of more than 1.5 billion people. A normalization of the relationship between the two countries will not only usher in a stable region, but also open new avenues for shared prosperity in the subcontinent.